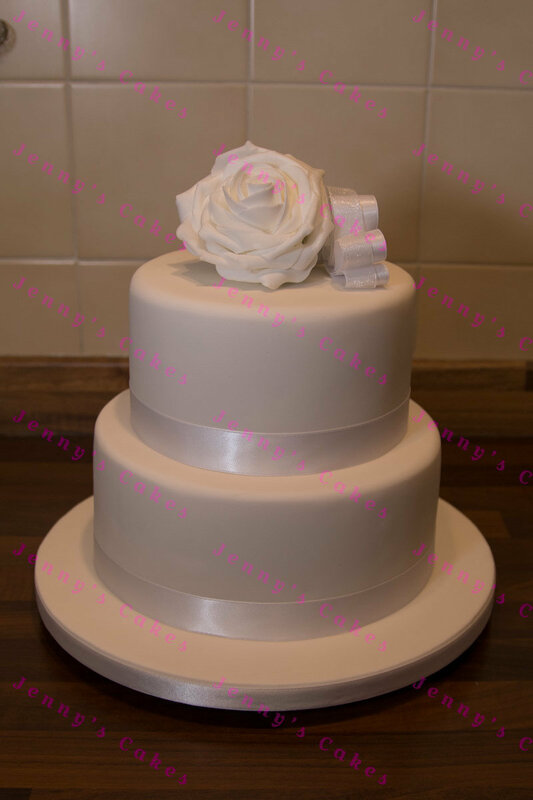 Gretna Wedding Cake- Small Two-tier Round Cake with Silk Rose Topper and Satin ribbons. This is a two-Tier Stacked Wedding Cake with a large silk rose topper and plain satin ribbons, based on classic simple wedding cake elements such as wide satin ribbons. Provides around 45 portions. This two-tier round wedding cake has been designed specifically for smaller weddings at Gretna- a stacked wedding cake, decorated with a large silk rose topper with soft ribbon loops, shown with a wide satin ribbon around the base of each tier. Priced from just £235 in sponge, including personal delivery to your Gretna Wedding venue.